NB The site had become unavailable and has been retrieved thanks to the Internet Archive. Some sections are currently incomplete or missing, where the files were not archived and have not yet been located. It is hoped to add these in due course. The author of this page is a born-again Christian first. 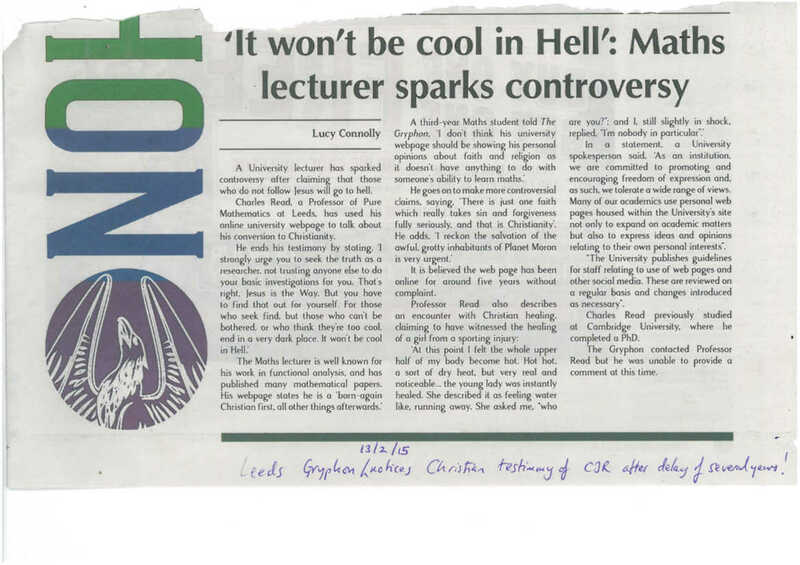 Here is the story of his conversion (which, as you can see, has been noticed by the Leeds Uni student rag - er - newspaper). This is in fact Charles Read's scuba webpage. 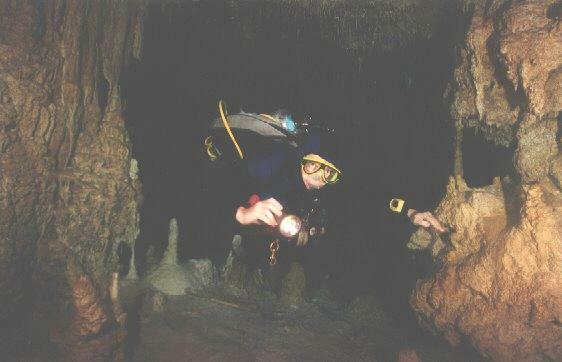 I appropriated the web addresses "www.solocavediver.com" and "solocavediver.com" - which are precisely equivalent - because cavediving is my hobby, plenty of the diving is solo, and I do not approve of the hypocrisy whereby cavedivers pretend to deprecate solo cavediving when (1) most of them do it and (2) all of their instructors do it. Thanks to Steve Gerrard for taking the photos (see above and below!). Cavediving logbook: Florida trip from 24/3/06 to 8/4/06 . 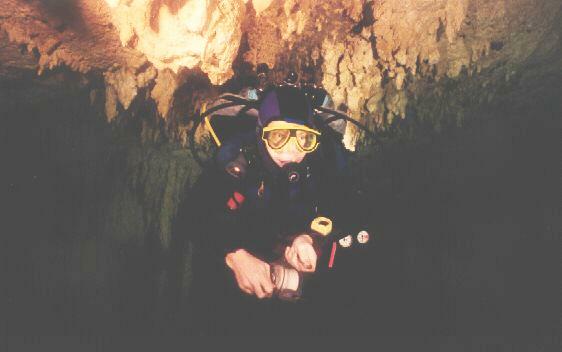 Cavediving logbook: Yucatan trip from 28/6/04 to 12/7/04 . 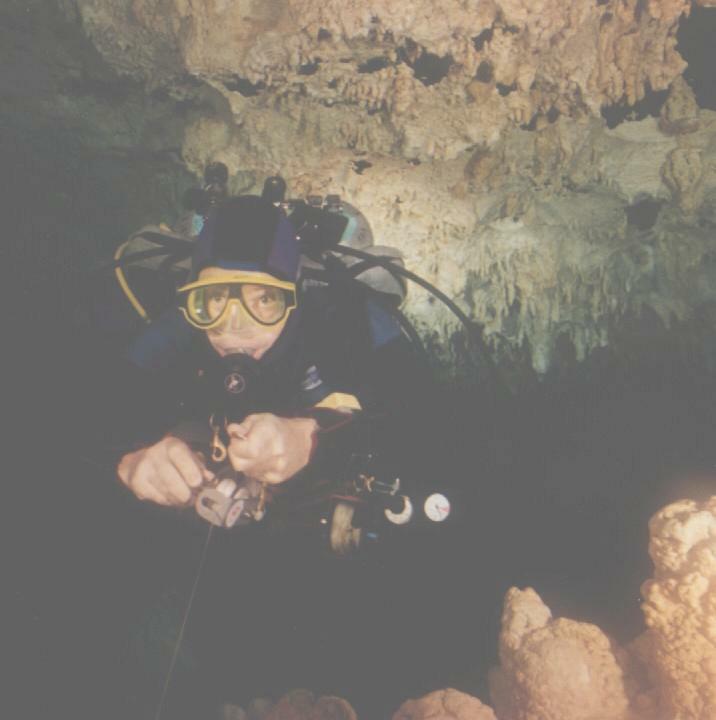 Cavediving logbook: my general logbook for all other diving activities. 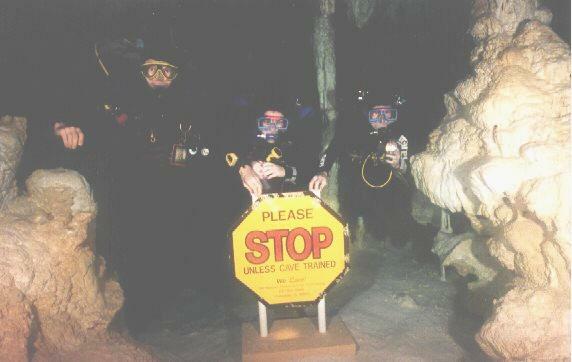 (including my first ever cavedive). New 31/05/02. Saying something nice about "TC". In the early part of my scuba logbook you can find some criticism of Ted Cole, the only one of my three diving instructors with whom I failed to get along. Now I naively assumed that I would keep the criticism anonymous by abbreviating his name to "TC" throughout - but there aren't that many cavediving instructors in the world, so it's pretty generally known that the comments refer to him. Since it would be implausible to pretend I didn't really mean it, I prefer to balance my comments with a short, honest article about some of his GOOD qualities - after all, we all have good and bad qualities, right? And with Ted, a certain particular good quality sticks very firmly in my mind. Click here for more details. "In Praise of Solo Cavediving"
A short essay on this topic will be found here Please note that though this is a statement of Yours Truly's philosophy about diving, it was rather written in haste (I received a couple of emails from DIR dudes asserting that I was nuts, and naturally wrote something with a view to winding them up further. I was Called... The Very Word of the Great Big Stalactite with the Loose Moorings came to me in a vision...) and it needs polishing. Also note that I still love diving with a buddy, though due to being busy and British I haven't managed to be in the same place at the same time as my American diving buddies for some time. 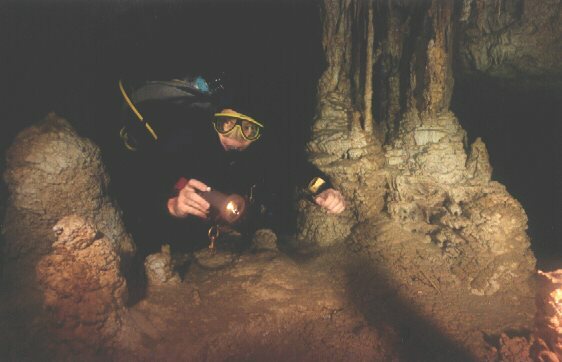 One alarming suggestion I had over the emails is that someone might conceivably get the idea that reading my webpage is enough to turn them into cavedivers (solo or otherwise) too. This is not the case. If you act as if it were the case, you are likely to kill yourself. My email address is above and I'll be happy to point would be cavedivers to people who will train them. To be sure, I was not always trained up to the level of what I got up to myself; but I got SOME training, and later got the full cave certification and all that. Click here for mathematical info on how to homebrew Nitrox (partially fill the tank with pure O2, then top off with air). 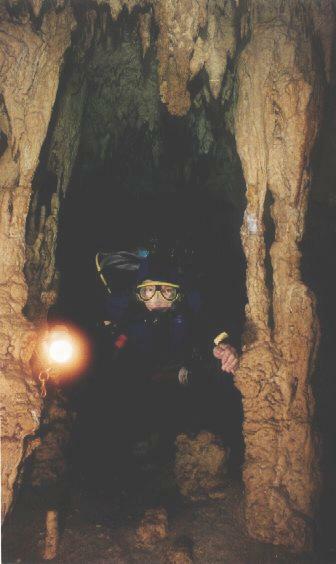 Click here for the British Cave Diving Group. Click here for "diver net". Click here for how to correct homebrew Nitrox mixes for van der Waals effect. Here is a paper by Erik C. Baker about understanding "M-values". Here is a paper by Erik C. Baker about "deep stops". Here is a paper by Erik C. Baker about ox-tox calculations. Here is a general "deco tutorial" by Erik C. Baker. Quite long - but excellently written, like the rest of this sequence of papers. Click here for a site I haven't dived but have had recommended. Click here for an interesting account of how to use bubble models for decompression strategies. The full mathematical description is in one of the references, rather poorly written though IMHO. I may write something myself at some point. Click here for general caving information.